Max Gallo was born to an Italian immigrant family in Nice, France. He is first and foremost a writer, having begun his career as a teacher, then working as a journalist and becoming an historian, television writer, and popular novelist. He is also the author of several nonfiction works, including biographies of Charles De Gaulle, Caesar, Napoleon and Victor Hugo, often published as multi-volumes. He was a Communist until 1956; in 1974, he joined the Socialist Party, and was named to various posts in the French government under François Mitterand. 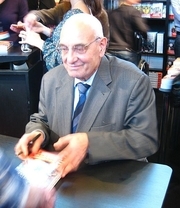 Max Gallo was elected to the Academie française in 2007. Max Gallo is currently considered a "single author." If one or more works are by a distinct, homonymous authors, go ahead and split the author. Max Gallo is composed of 2 names. You can examine and separate out names.